Open areas. Meadows, prairies, pastures, croplands, brushlands with little or no ground cover. This is a solitary, medium-sized, common but seldom seen, carnivorous mammal. They are 28″ to 34″ in length, including the tail, and weigh 11½ to 24¾ pounds. Males are significantly larger than females. Badgers rarely live more than 4 or 5 years in the wild, but may live 10 years or more in captivity. The body is stocky, low to the ground, and somewhat flattened. The fur (pelage) on the upper parts is yellowish-gray to reddish-brown and long, especially long at the sides. The longer hairs (guard hairs) are banded, giving the pelage a grizzled appearance. A bold, white, upper-middle (middorsal) stripe runs from the nose, over the top of its head, and ends on the nape of the neck near the shoulders. It does not extend onto the back. The underparts are buffy. The belly is whitish. The tail is short, 4¼″ to 7½″ long, and bushy. The head is broad, especially at the back. The neck, crown, and nose are dark brown or black. The cheeks are white with a large black spot in front of each ear. The chin and throat are whitish. The ears are low and are edged with white. The legs are short and stocky. The feet are dark brown or black. The claws on the front feet are extremely long. Common badger (Taxidea taxus taxus) is the largest of the four subspecies. Jackson’s badger (Taxidea taxus jacksoni) is typically darker and smaller, 23½″to 29½″ in length and weighing 15½ to 24¼ pounds. The low, flattish profile and white middorsal head stripe are diagnostic. There are no similar species in North America. Mostly ground squirrels and pocket gophers, but also voles, mice, reptiles (including rattlesnakes), amphibians, ground-nesting birds and their eggs, insects, and other invertebrates. Mating takes place in August and September. The female then digs a nest at the end of its burrow and lines it with grass. The developing fertilized eggs (blastocysts) do not implant in the uterus until February or March. A litter of 1 to 7, usually 3 or 4, is born in March to early April. The female cares for the young until late summer or early fall. Badgers are active mostly at night but also often during the day, especially in early morning. They are solitary animals. Badgers are good diggers. 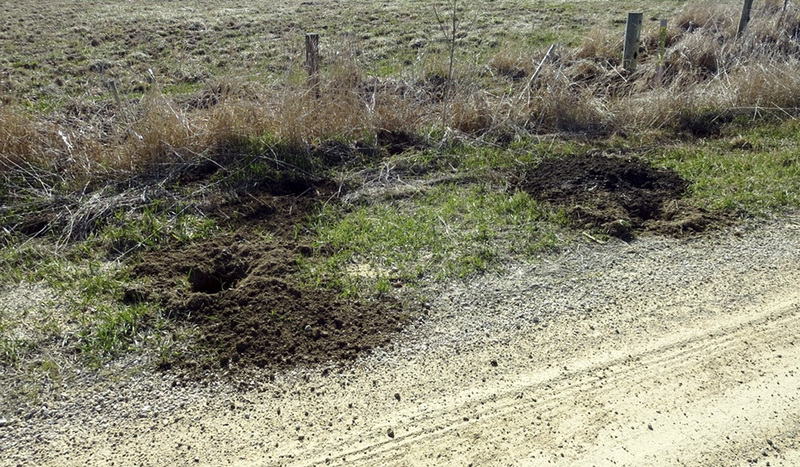 They are the only mammal that can dig out pocket gophers. They usually dig their own burrow but may enlarge one dug by another mammal. They spend the day, raise their young, and spend the winter in a burrow. The burrow may be up to 26′ long and up to 6¾′ deep. Adults have a home range of usually about 1 square mile in which they may have up to 46 burrows. In the winter their home range is much smaller. They are mostly inactive in winter, emerging occasionally on warmer days. They do not hibernate but may enter into a temporary state of reduced metabolic activity (torpor) lasting several days to several weeks. Common badger (Taxidea taxus taxus) range includes Iowa and the Dakotas and extends into the western border counties of Minnesota. Jackson’s badger (Taxidea taxus jacksoni) range includes Wisconsin and the remainder of Minnesota.. There are four, fifteen, or twenty-one subspecies of badger in North America, depending on who you ask. 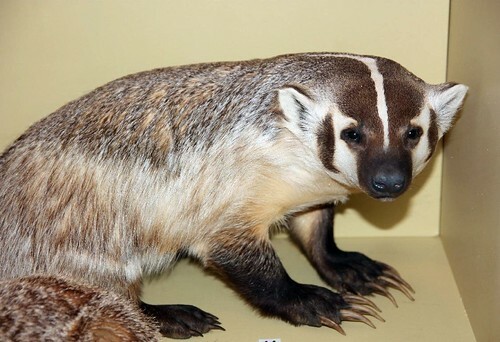 All sources recognize the two subspecies found in Minnesota, common badger (Taxidea taxus taxus) and Jackson’s badger (Taxidea taxus jacksoni). Badgers are animals of open places. Their spread into forested regions has closely followed the clearing of those forests to create pastures and cropland. The common name is thought to refer to the black “badge”-shaped markings on their cheeks. Very early in the morning, we saw the badger’s eyes reflected in the headlights, then as we got closer saw its head just above its hole. We watched it for a bit, and then it withdrew into its hole. I went back later to take some photos, but I didn’t see it again. The Badger Whisperer - Face to Face with the American Badger! The Internet has made the Honey Badger a true celebrity but in the wake of its stardom North America's Badger has gone a bit unnoticed...until now! This week Coyote Peterson and the crew are headed into the back country of Montana to work with Moxie, an American Badger who was abandoned as a cub and raised in captivity to be an ambassador for her species. These mustelids, or members of the weasel family, are well known for their feisty attitudes and aggressive behavior...so will Coyote be able to befriend this badger? This is an episode you have to see to believe! Breaking Trail leaves the map behind and follows adventurer and animal enthusiast Coyote Peterson and his crew as they explore a variety of wildlife in the most amazing environments throughout North America! 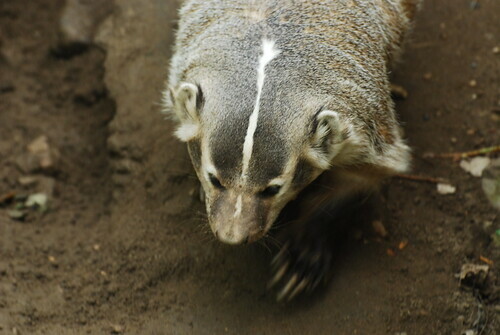 A look at the American Badger. 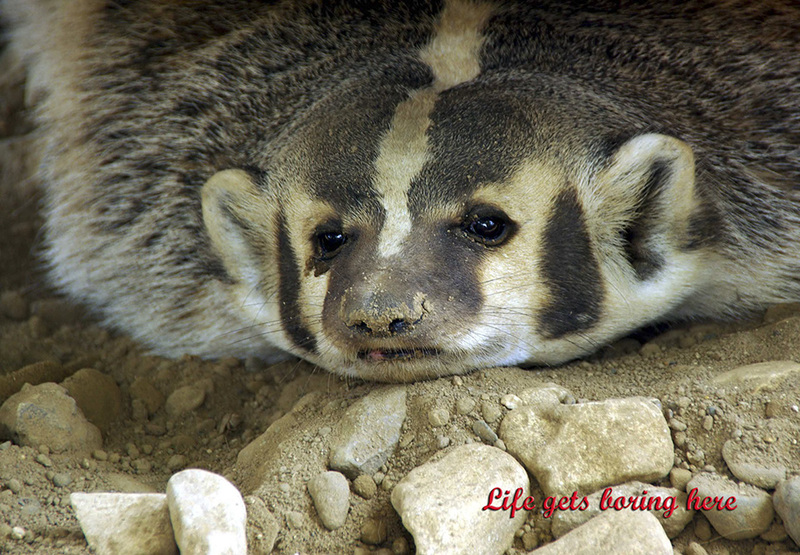 American Badger. This is a badger that made his home under our house. Savage BADGER, I think not. He stuck around for about 4 months or so. Befriended our Pug Odin. And eventually moved on. Never aggressive, never bit or in any other way harmed us. A couple times he followed me out to our clothes line and stole some towels off the line, but other than that completely harmless. Still, he was a wild animal. We named him Schnitzel. American Badger. Watch Neal Hunt and the Soar No More Crew as they catch a wild badger with gloved hands, a sheet, and a dog kennel. Most amazing badger films caught on tape! The music is called "Chase Pulse" by Kevin MacLeod. Set in the scenic country of the American west, this story follows two badger cubs from their birth in a prairie den. I saw a dead badger on highway 95 between North Branch and Cambridge at 7:30am on Sept 20th. It was gone by the time I came back through at 5pm.